“Make a Difference Day,” is an annual community service event held on the fourth Saturday of October. This past Saturday dozens of volunteers showed up at the Jackson Zoo to help paint, pick up trash, and trim bushes. 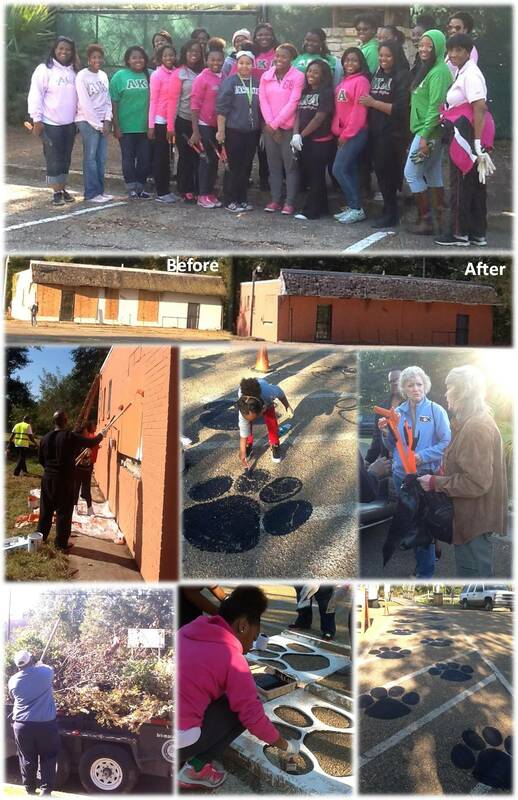 This event was hosted by Keep Jackson Beautiful, Zoo Area Progressive Partnership, and the City of Jackson. There were volunteers from JSU, Tougaloo College, Stewpot, Voice of Calvary Ministries, Atmos Energy and community residents. However the largest group of volunteers were from the AKA’s. There were over twenty AKA’s in attendance, decked out in pick and green, and they were excited about doing community service work at the Jackson Zoo. All the volunteers cleaned up areas of Capitol Street, painted a building right across from Zoo entrance, painted paw prints from the Zoo ticket office to the train, cleaned and replanted the flower bed at corner of Capitol and Parkside and worked in Livingston and Claiborne Parks. There were also volunteers from Hinds County and the City of Jackson. The community service project was a huge success due to all the committed volunteers that came and helped clean up. If you want to plan your own neighborhood clean up, contact Marsha Hobson with Keep Jackson Beautiful at 601-398-5219 or email her at keepjack@bellsouth.net. She can assist with planning and providing rakes, gloves, and trash bags.